When the temperature has dropped into the near-freezing (or lower) range during the last couple of years, I've donned my Belstaff (now branded BMG for British Motorcycle Gear) Discovery jacket/exoskeleton. The tank-like Discovery once kept my core temp within normal limits on a 62-mile commute at 9F, without a heated vest. Brits ride in a lot of nasty conditions and so know how to design riding gear to cope: Hitena nylon, Scotchlite reflective, Knox CE armor (including back protector), rain skirt, crotch strap (no kidding! ), YKK zips, Thermolite liner, neck warmer, removable rear poacher pocket, and a complex series of flaps, velcro closures and pockets that keep wind and rain at bay. I've intended (meaning I've been too lazy) to do a review, but the folks at webBikeWorld recently beat me to it and did their usual thorough job. Click on over to read wBW's review of the Discovery. I added my .02 in the Owners Comments at the end of the article. The primary difference between my Discovery and the one wBW tested is that mine was made in England. As far as I can discern, the original Belstaff company was bought by an Italian firm, which chose to discontinue the old Belstaff line of gear. 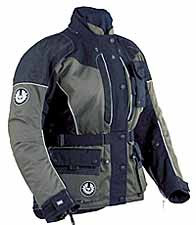 BMG acquired the North American rights to the old Belstaff line. My guess is that after selling off existing stock of original made-in-England Belstaff-branded gear, BMG began manufacturing in China and selling the gear under the BMG brand. I know your bike and I see you a lot of times in the mornings I guess on your way to work. Out there in all types of weathers and in the freezing cold. You're crazy, man! My bike stays covered up in nasty weathers.